Erie Canal in Lockport, NY. Image: W.H. Bartlett, 1839, wikimedia commons. The waters announced their engagement in 1817 but would not be wedded until 1825. 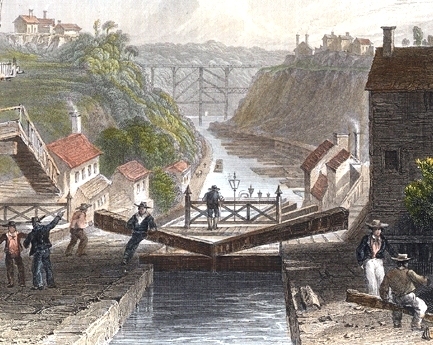 Upon the bicentennial of the Erie Canal, concert tours by water will ring celebratory along the route credited with shaping the economic and political destiny of the United States. Historians say the Erie Canal may have been inspired by Robert Fulton, of steamboat fame, who admired the Canal des Deux Mers in France. Once the engagement’s union was fulfilled, in the “wedding of the waters,” the Erie Canal was an instant success. Shipping goods from Buffalo to New York City before, required two weeks; via the canal, three days. Similarly, the cost of transporting goods by land, formerly $100 per ton, was now reduced to $10 per ton. What are the waterways of the future? Such considerations will be explored at the World Canals Conference, convening this year in Syracuse, New York, on the Erie Canal. Dilma Rousseff, President of Brazil: official photo, 2011. Image: wikimedia commons. Cantareira reservoir, supplying water to 6.5 million Brazilians, is running on empty: 7% capacity in 2014, down from 50% capacity in 2013. Could building canals, like China’s Grand Canal, or France’s Canal des Deux Mers, be the answer? If drought is not solved, there will be energy problems as well: 80% of Brazil’s electricity is hydropower from plants including Itaipu. What actions should president Dilma Rousseff take to solve Brazil’s water crisis? “An about-face on the subject of transportation and infrastructure,” Erik Andrus, founder of Vermont Sail Freight Project. Photo above: vessel “Ceres.” Image: courtesy of www.vermontsailfreightproject.com. Infrastructure. The word implies awesomeness, technical complexity, hard hats, and the oversight of engineers. For those not involved in its planning or creation, our built environment can seem largely the individual’s ability to participate or comprehend. The Vermont Sail Freight Project was conceived as an about-face on the subject of transportation and infrastructure, an attempt to borrow heavily on historical patterns and to utilize public commons to perform a service of contemporary economic relevance, and in so doing to set a mold for an alternate way of transporting and doing business that is more in tune with the limitations of our planet. The Crimea. Image courtesy of wikimedia. Popular with the ancient Greeks, who called its main river Borysthenes, favored by the Romans, Bulgars, Goths and Huns, the Crimea offers port access on the northern border of the Black Sea, with the advantage of also being on the western shores of the Sea of Azov. In medieval times, the Crimean Khanate united the area, but later it became the Taurida Oblast in 1783, and still later the Soviet Crimean Oblast, transferred to Ukraine in 1954. Finally, in 1991, the Autonomous Republic of Crimea was born, only to be challenged in 2014. Why so many changes ? Advantageous port territory, milder winters, access to the Dnieper River (fourth largest in Europe). Today operating more than 12 seaports, the Crimea demonstrates the power of ports. The importance of waterways and ports can also be seen in the Canal des Deux Mers and the Erie Canal. Another famous port, St. Petersburg, once the capital and Russia’s largest seaport, still carries the cultural imprint of its founder, Czar Peter the Great, in 1703. Can present day Crimea take inspiration from aspects of St. Petersburg’s success, including business monopolies? Perhaps in partial explanation of why the game’s greats are often Russian, St. Petersburg was once the only source of chessboards. What strategies for economic and cultural success should the Crimea envision for coordinates 45.3N by 34.4E? Canal des Deux Mers. Image: Wikimedia Commons. Historians might trace the first SEZ to 1666, citing the Canal des Deux Mers or Canal between the Two Seas. Connecting the Atlantic to the Mediterranean, the Canal was an economic success; using a medieval model, Pierre-Paul Riquet worked with the French government to make the route an independent fief. Special Economic Zones (SEZ) in more recent times must include Puerto Rico in 1942, and economists point to Shenzhen as the very important first SEZ in China; once a village, Shenzhen grew rapidly when advantageous business and tax laws were granted in the 1980’s to promote commerce. Recent research by the World Bank explores SEZ success factors. It must be noted that many Special Economic Zones involve water locations. The Canal des Deux Mers is not just an economic but also an environmental achievement, preserving and enhancing a waterway that today is a World Heritage Site. Can France’s Canal des Deux Mers inspire new forms of environmentally wise SEZ development? Might the Dutch success of protective dikes and land reclamation be emulated in coastal environments? Will Frank Davidson and Ernst Frankel prove visionary in proposing a free-trade zone enhanced by artificial islands or reclaimed land from the sea offshore Israel and Jordan?